There are two very different styles of mountain-climbing. The first is expedition style: using a larger team to establish a series of base camps at increasing altitudes, with enough supplies and equipment for a safe and steady ascent. The second is alpine style: moving fast and light, carrying as little equipment as possible, striking out rapidly at the peak. An alpine-style ascent allows for rapid success with a relatively small investment of time, money, and personnel. When things go wrong, however, it can be incredibly dangerous. Last week marked the five-year anniversary of ‘The Human, Earth Project’. Our work has always been done alpine-style. Over the past five years, we’ve achieved some stunning victories – but I’ve also learned how difficult this work can be without the proper support systems in place. We succeeded in finding my kidnapped friends in China, and supporting the first through her return home to Vietnam. Our story has reached millions, even before it has been released in any definitive form. Our feature documentary, ‘Sisters For Sale’, will always stand testament to how much we’ve been able to achieve with so little. Whatever happens now with the film, it has been a remarkable achievement, and one I’ll always be thankful for. For me, the film will also stand testament to the price paid in the stress and frustration of not having allocated sufficient resources in advance. That’s not a mistake I’m willing to make again. ‘The Human, Earth Project’ is no longer a brief expedition, as it was originally conceived. Whatever else I might have planned for my life, I realise now that this project is here to stay. It’s time to start building and supplying a base camp, for the long haul. ‘Sisters For Sale’ has been a victory against incredible odds, and we all like that kind of story – until we have to live through it. Next time, I’m going to make sure the odds are in our favour. I was once a talented Business Studies student, selected in the top five from an accelerated class in a selective high school. Oddly enough, I’ve applied none of that knowledge to ‘The Human, Earth Project’ – because I simply never thought of it as a real and lasting organisation. But that’s what it now needs to become. Human trafficking is a monstrous issue, affecting tens of millions of people around the globe. Most of us are now aware of human trafficking – but do we know what it really means? Unlike the vast majority of human trafficking stories we’re exposed to in the media, ours is a very personal story exposing the true complexities of this issue. I’ve spent the past five years immersed in human trafficking stories, and there really isn’t anything else like this one. Ours is a unique and fascinating story which has proven itself time and again via new and traditional media. It’s a story which can make a very real difference against human trafficking – if we can get the right support systems in place. 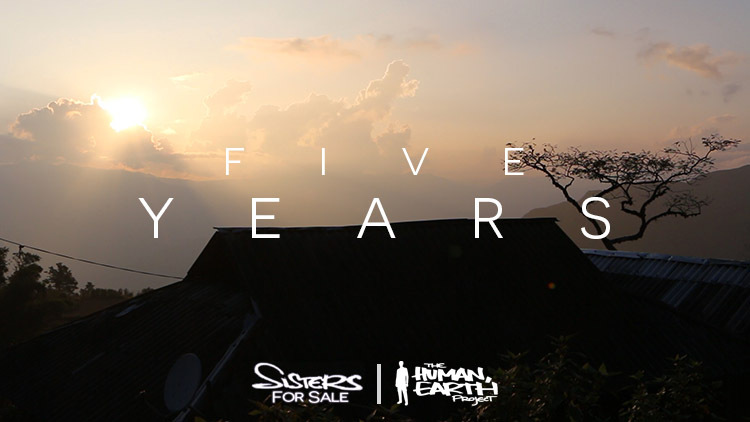 Over the past three years, ‘The Human, Earth Project’ has had a singular goal: to finish the ‘Sisters For Sale’ documentary. The documentary is almost complete, yet my work is far from over – in fact, it is only becoming more complex. A series of other peaks now stands before us. I’ll be working towards several interconnected goals over the coming years, all with the same aim: to continue raising awareness of the global human trafficking crisis. The sound and music are all that remain to be completed on the documentary (I’ll be writing more about that soon!). While post-production is almost finished, the documentary’s true journey is only just beginning. A great deal of our time and energy is now being spent on distribution, promotion and impact strategies for the film, which has been submitted to numerous film festivals in North America, Europe and Australia. Thanks to our amazing translation teams, ‘Sisters For Sale’ has been (or is being) translated into Chinese, French, German and Spanish. Besides the documentary, ‘Sisters For Sale’ is also to be released as a 10-part podcast by the BBC’s Claire Harris, and a book which I’ve begun to put together already. Both of these will allow us to share more of the compelling and complex story which simply didn’t fit into the film. There’s also the later possibility of touring the film personally, to connect directly with communities around the world and spark discussions on human trafficking and women’s rights. There are more distant peaks, too – such as a potential companion piece to ‘Sisters For Sale’, diving deeper into some of the fascinating issues and stories touched upon in the initial documentary. Then there’s ‘Epic’, our marathon 2013-14 search for 100 strangers across 10 countries in 10 months. While overshadowed by the events of ‘Sisters For Sale’, the ‘Epic’ journey was also filmed from beginning to end, and is to be released as a series of feature documentaries. While all of these things may sound ambitious, ambition is one thing this project has never lacked, and we could never have come so far without it. However, all of these things demand time, energy, and money, and our resources are limited. Over the past few months, I’ve been examining two distinct alternatives for the future of ‘The Human, Earth Project’. The first is to expand and grow as a non-profit organisation, relying on grant money and donations to fund our work. While this may seem a “purer” path, I’ve been relying on the generosity of others now for five long, unpaid years, and it’s not something I wish to do on a permanent basis. For five years, I’ve relied on your contributions. I’ve been deeply grateful for your support, and have wanted to maximise the impact of every dollar – to a point where I feel guilty if I’m not working, or if I take any funds to cover my own needs. It’s a system that worked well in the short term, but simply isn’t sustainable, especially with the incredibly long hours I’ve worked to finish the documentary. For years, I’ve taken only the most basic living expenses for myself, averaging below $25 a day for food, accommodation and all necessities. I feel as though I have very little time or money of my own, that everything I have I owe to other people. It’s a situation, I’ve realised, that ultimately harms both myself and my work. I’ve been asked why I don’t pay myself a reasonable wage, and the answer is simple – the money just isn’t there. If I’d paid myself properly, this project would have been bled dry years ago, and the documentary would never have been completed. I understand now that even if our funding was to be increased dramatically, the dilemma would remain the same. I’d still be forced to balance the needs of the project with my own personal needs. Being the kind of person I am, I’d know I’d pour as much as possible into my work, and bleed myself dry. It’s time to find another way. The second option is the path of self-reliance – to find a way to generate enough income from the project that our work might continue. Though it may be more challenging than the first option, it now seems preferable to me. What does it mean? It means selling things to support our work. It doesn’t mean compromising the ideals upon which our work is based, or making that work any less effective. At various times, since the very beginning of the project, I’ve offered certain rewards in exchange for contributions – desktop wallpapers, postcards, photographic prints, access to the film itself, your name in the credits. These things are no longer available to contributors – some haven’t been for years. While I know that many of you have contributed from a simple desire to help, with no need of a reward, I also know that the availability of these incentives has had a marked effect on the quantity of contributions we’ve received. Many people like to have something to show, and to share with their friends. Many of you have expressed an interest in having something physical from the project – a poster, a T-shirt, a DVD copy of the film (when it is released). I’ve also been approached by numerous organisations around the world to speak about my experiences. In searching for a way to keep this project alive and strong, these are some of the ideas I’ll be considering first. Each of you is an important part of this project. Some of you have been following the evolution of our work from the very beginning, five years ago. Some of you have joined more recently. If you’d like to have a voice in this process, I’d love to hear your thoughts. Perhaps you have an idea I haven’t yet considered. You can email me directly at thehumanearthproject@gmail.com. I want to give a huge thank-you to Qiuda Guo, who has been an avid supporter of our work from the very beginning, and whose behind-the-scenes efforts have been unseen but vital to our work – thank you! Subscribe here to receive all the news on ‘Sisters For Sale’ and ‘The Human, Earth Project’, including release dates for the documentary!